What’s Black and White and Speckled All Over? She’s the one I told you about yesterday that I took to an adoption event (so, before you get all excited, no she is not my new foster). Mark says I’m just on a “falling in love” kick since I miss Johnnie. I say that Jayla is AWESOME and how can anyone not fall in love with her!? Let me tell you about her. Dogs like Jayla are actually very refreshing to me (have I talked about this before? I feel like I’ve talked about this before… I’m sorry if I’ve talked about this before!). To be totally honest, it’s very easy when you’re working at a shelter to sort of have your eyes glaze over and stop seeing every dog individually, but rather as a whole group of animals who need help (Animal Farm Foundation addressed this in a very interesting blog post about the concept of psychic numbing). I don’t do it consciously, it just sort of happens… maybe it’s our mind’s way of sparing us a bit of the emotional torture that comes along with working in animal welfare. In any case, it’s not every day that I find a dog I really, truly fall for. 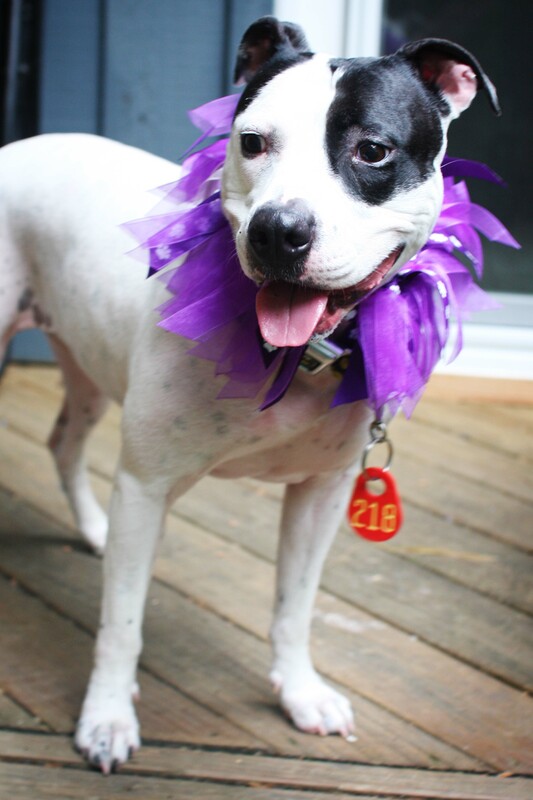 Jayla, like lots of the dogs in a shelter, gets lost in the crowd. At four-ish years old, in the sixteen seconds it takes for someone to walk past her kennel she is just another black and white dog with short fur and a big head. Even when I first took her out, she was distracted and investigating her new environment. Not that I blame her – new places are ohsointeresting when you basically live in a box – but it’s hard to bond with a dog like that. It was only after spending about thirty minutes with her did she start to warm up to me. And it turns out that she is a big sweetie! Point #1 for Jayla: awesome passenger in the car. Any dog who sits nicely and even falls asleep on their first ride in the car is awesome in my book. Point #2 for Jayla: calm around other dogs. After dealing with a few “over eager” pups, boy was this a nice change! Point #3 for Jayla: she’s tolerant and up for anything. Being around her while she’s got a bully stick? No big. Hanging out with kiddos who want to run and squeal and pull on her tail? It’s nothing. Taking her to new sights and sounds? Easy peesy. It seems pretty evident that Jayla’s wisdom and maturity comes from the fact that she’s past her teenage years (she’s about 4, remember). She’s over the partyin’ and would rather just hang out on your couch. Oh, and those belly spots? Feel free to give those a nice long rub while the both of you are enjoying a lazy Sunday afternoon. Sounds perfect, doesn’t it? I tell ya, if I wasn’t moving in July this little girl would be in my house on my floor at my feet right now (whether foster dad liked it or not ;-)). And yes, I stole her away for a bit after the adoption event and introduced her to my parents and my yard. 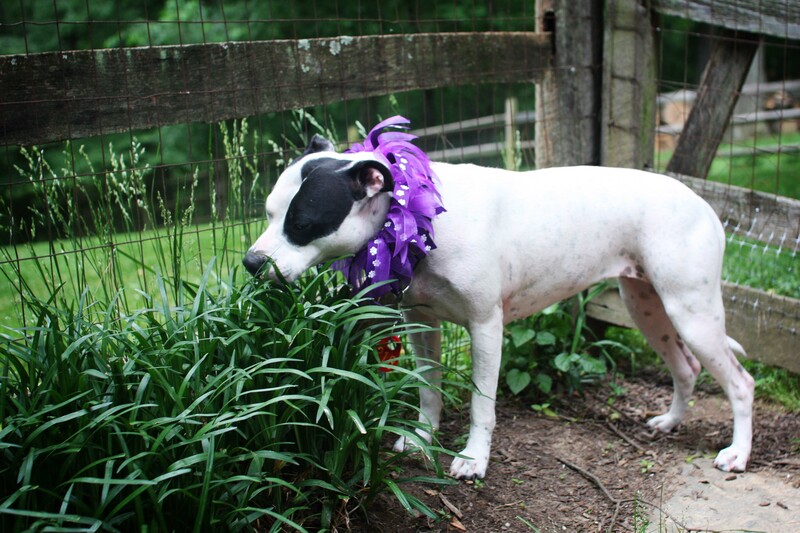 They fell in love with her, and she fell in love with them (okay, maybe mostly the yard). Sometimes you just have to fall for one again to remember why you do it! 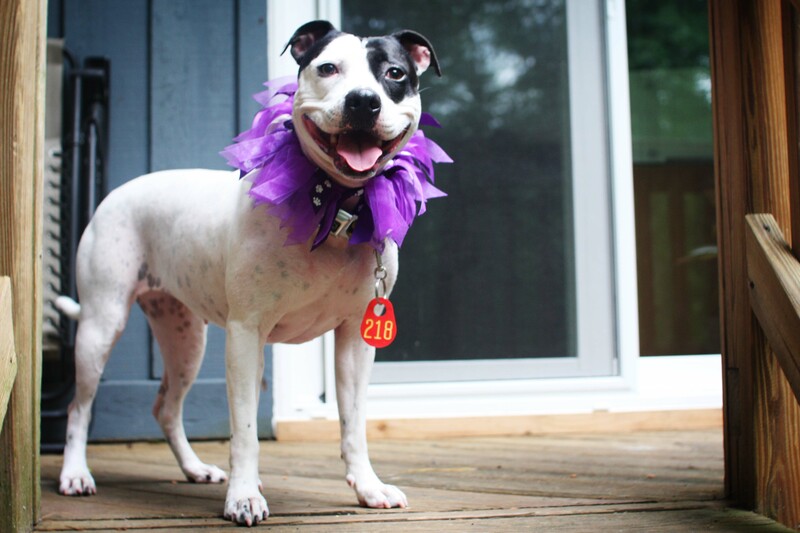 Looking for a laid back gal whose favorite thing to do is hang in your lap and make you smile? Email me at peacelovefoster@gmail.com. 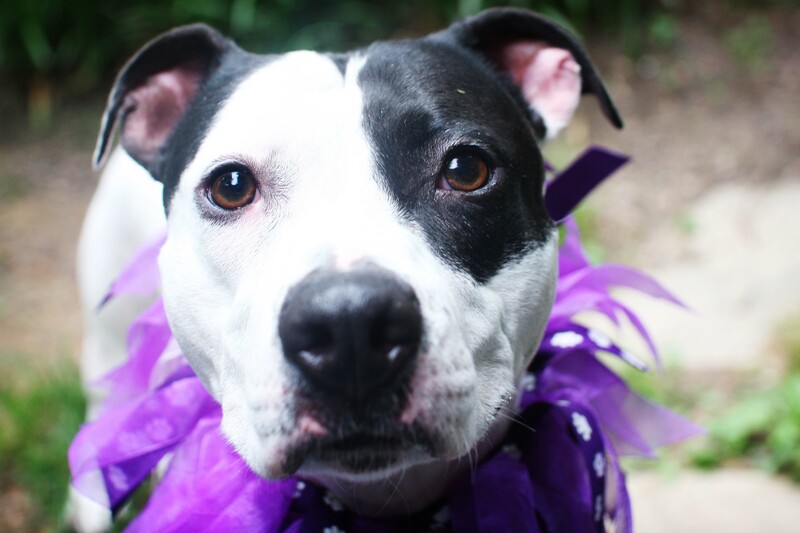 This entry was posted in Dog talk, Photography, Rescue/Humane Society, Uncategorized and tagged adopt me, adoption event, black and white dog, jayla, older dog, pit bull mix, shelter dog, why older dogs are better than puppies. Bookmark the permalink. Oh, I’m dying over her. She is the cutest. Reminds me a lot of our black and white pittie! She has lots of spots like Jayla does. I hope someone adopts her and gives her a lovely life. she has the greatest smile! EEK – THOSE SPOTS! LOVE!! The patch eye is killing me with adorableness! Jayla was one of the dogs we visited when we found Teddy, she really is a sweetheart! She is precious! Would love to hear updates about her, even if you’re not fostering her. What a cutie! I can’t wait until we are a bit more settled in our home ( and have the fence doggy proofed). 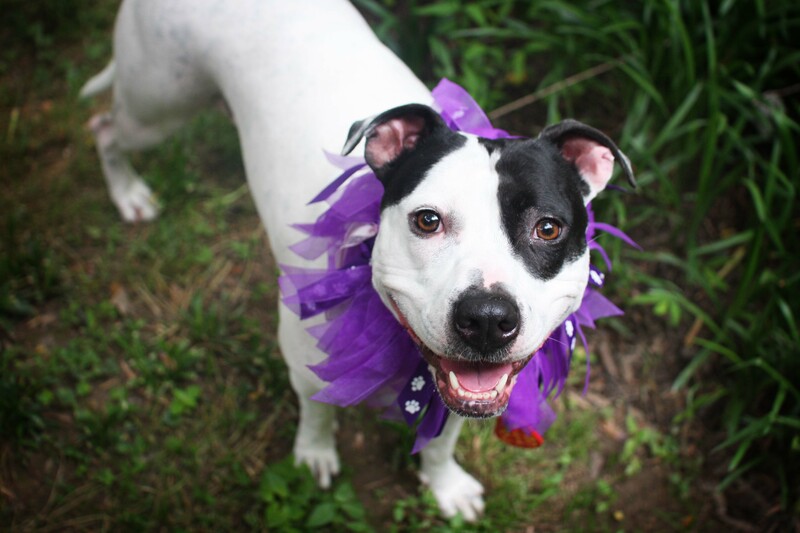 If we could adopt right now, I know exactaly where I’d be tomorrow…..at the shelter looking at this beautiful girl! I love how you still show case the shelter dogs, even if you aren’t fostering them. It’s nice to see them in a different setting than the shelter.